If you’re into the modern look for your Twitch channel, then these panels are just the right fit. 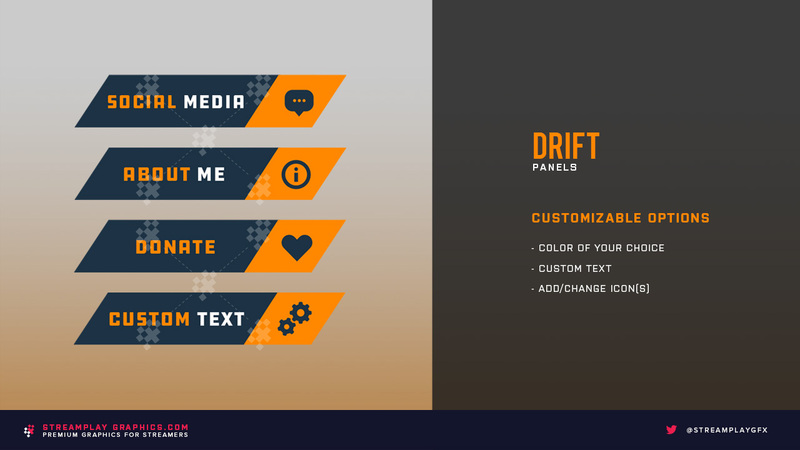 Designed with slight angles on each side to add a bit of style, your Twitch profile will look awesome with these Drift panels! The Drift Twitch panels are part of a package that includes an in-game overlay, a webcam overlay, alerts, stream labels, and these panels you’re looking at now. 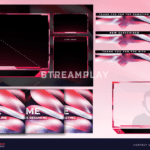 If you’re interested in upgrading your other stream graphics while keeping a consistent and professional look, then check out the Drift Stream Package here for a package deal. 1. Download Default Panels (+PSD Files) – If you don’t need any customizations (color/text), or want to make the edits yourself then this is the option for you. 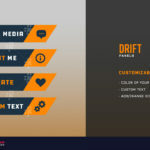 With this option you’ll be able to instantly download all of the default Drift panels that will look exactly like the preview image above, as well as a PSD file for you to customize yourself. *Comes with 7 panels as .png files and the PSD file for editing. The 7 panels are, About Me, Schedule, Rules, Social Media, Donate, Subscribe, and PC Specs. With this option you’ll be able to let us know what edits you’d like made, then we’ll personally make those customizations for you then send your finished panels to you via email once completed. *All panels are sized to Twitch/Mixer standards which means they’ll fit perfectly on your profile. have these panels ready for your next stream! Includes 7 panel graphics (.png files) + the PSD file for editing.